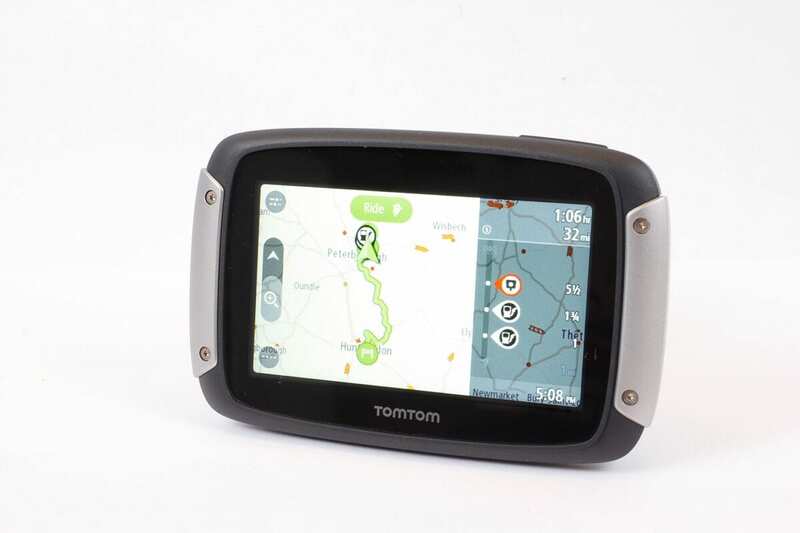 If I could only buy one accessory for any bike, it’d be the new TomTom Rider. While it takes all the stress out of business trips that see me needing to get from A to B in a specific time, it’s also transformed my pleasure rides, and made touring much more enjoyable. 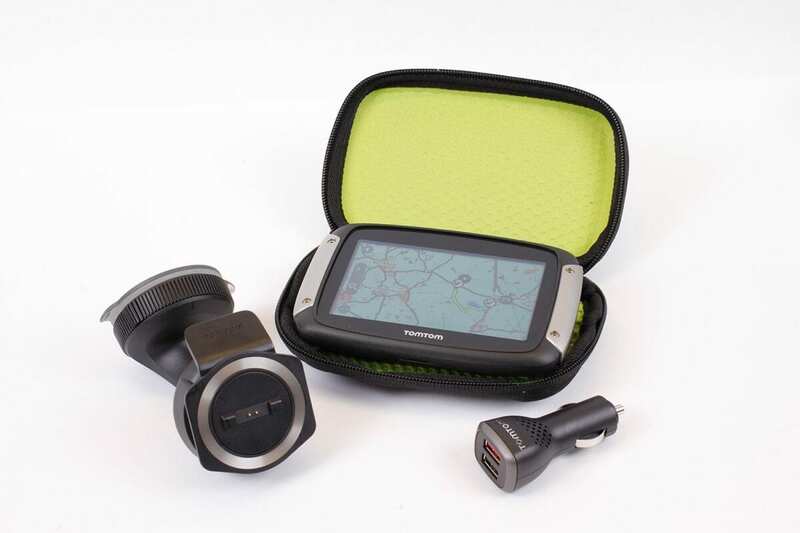 There are three buying options, all with free lifetime updates to the mapping, and lifetime live traffic (when connected to a data-enabled phone): the 40, which comes with Western Europe (23 countries) for £279.99; the £319.99 400, which comes with all 45 European countries mapped and lifetime speed camera updates; and the 400 Premium Pack, which at £399.99 also includes a car mount, locking bike bracket kit and a carry case. I think the extra £40 to have all of Europe (who knows how far you might go in future) is worth the expense of the 400; the speed camera updates are also very handy, and are proving incredibly accurate. It’s also worth noting that the 40 has 8GB of internal memory, while the 400 has 16GB. You can add a MicroSD card, but the other stumbling block if you’re considering upgrading the Western Europe map to full Europe is that you won’t get the free lifetime updates – a single purchase currently costs £29.97, while a year (four updates) costs £35.97. For a further £80, the premium kit is good value when you consider that the car mounting kit (it’s a powerful sucker for the windscreen) includes an excellent two-port 12V USB charger and costs £49.99, while the anti-theft kit that secures the unit on your bike costs £64.99. The case is £24.99, so you’re getting a total of £139.97 of accessories in the bundle. The lock is only really good enough for popping into the services for a break, not leaving the unit attached outside overnight. However, especially with the live traffic updates and its built-in speaker, the Rider is a fantastic car sat-nav. I consider the car mount an essential item, so if you can afford it, go for the Premium pack. The navigation over several thousand miles in four countries has been superb. Audio on my bike is linked through my Interphone, giving very clear directions with spoken street names, and the screen is clear in all but direct sunlight (moving my body to create a shadow always cures any glare when the sun’s behind me). The graphics are very simple to follow, with major junctions showing an illustration of the road layout, along with the lane to take. The unit can be rotated through 90° for a landscape or portrait view (I find this a bit of a gimmick, never taking it out of the wide layout), while a vertical bar on the left of the display shows the distance to key points, destination and petrol stations. This is a superb idea for bikes, giving you confidence that you’ll make it to the next fuel stop. It only shows filling stations on the route, so some motorway services that are just off a roundabout might not display. Of course, the TomTom will still allow you to search for all filling stations nearby, including those off your route, if you do get desperate. 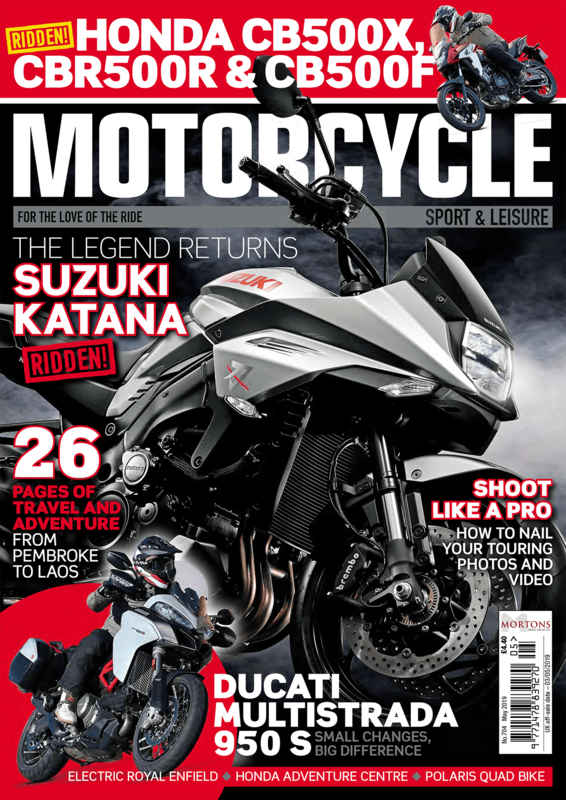 A major selling point of the Rider is ‘Plan a thrill’ – choose a destination by searching, or touch the location on the easy-to-navigate map, then pick one of three levels of twistiness, and three altitudes (more use in Wales or the Alps than in the Fens); the TomTom will look for what it considers to be the most exciting route. When tapping the screen to select a destination, the Rider will plan a circular route that includes this location (it can be one of your ‘favourites’, which are displayed as a flag on the map). If you choose to pull up the ‘set destination’ menu, you can search for any location, and are given a one-way route. Some of the roads I enjoyed were a bit too tight or rough for an all-out sportsbike, and it’s hard to know what you’re going to find when you plan a route. However, for exploring on most motorcycles, it’s a huge amount of fun. You can download GPX files and import them to your Rider (select the correct filename, not the one with an underscore in front of it) by connecting the unit to a computer via USB, or by using a MicroSD card; until a wireless connection is added (a likely future update), this would be the most convenient method, if only the little card wasn’t such a fiddle to extract. 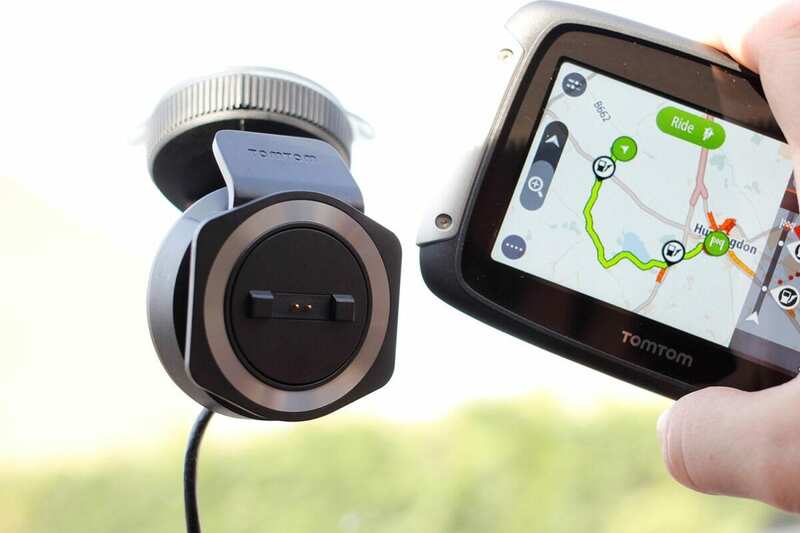 TomTom uses Tyre – a third-party software – for PC-based route planning, but there’s no Mac version available. You can of course use other software to generate your GPX files, but this is where TomTom falls down for some. I know of users that run it with Garmin’s Base Camp (Mac and PC), but this relies on having a Garmin device to get detailed maps. As a Mac user, and not tending to plan many routes on the computer, I used to use Google Maps, then copy the page URL into www.gpsvisualizer.com/convert_input, where I could export the GPX file. It’s a little clunky, but it works. 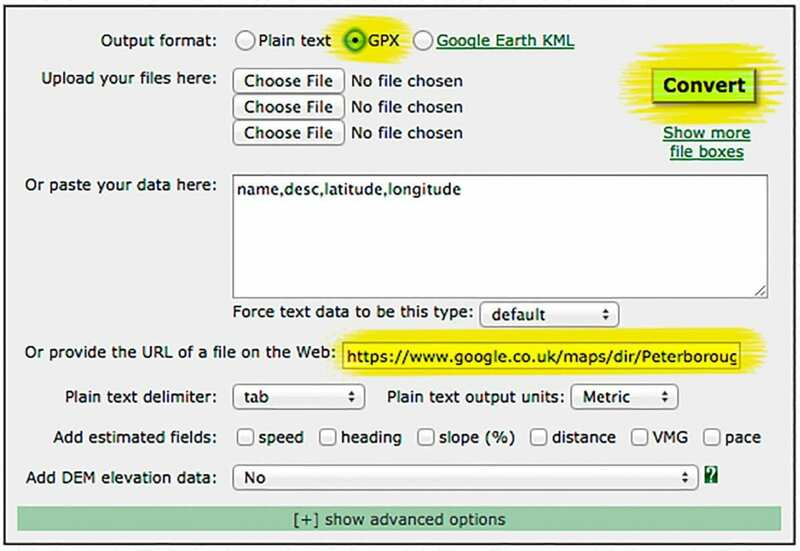 Another option, which gives you the opportunity to create larger routes than Google now does, is www.gpxeditor.co.uk. The great benefit of the TomTom is the ability to plan a route without having to sit in front of a computer. When using ‘Plan a thrill’ it’s possible to pinch-and-zoom your way around the excellent map a lot quicker than on previous models, and setting way-points is simply a matter of tapping the location. Where you have specific roads in mind, you’ll probably still want to use a computer for planning, but after my experience in Belgium I’m generally quite happy to tell the Rider where I want to go, then let it decide on the route. 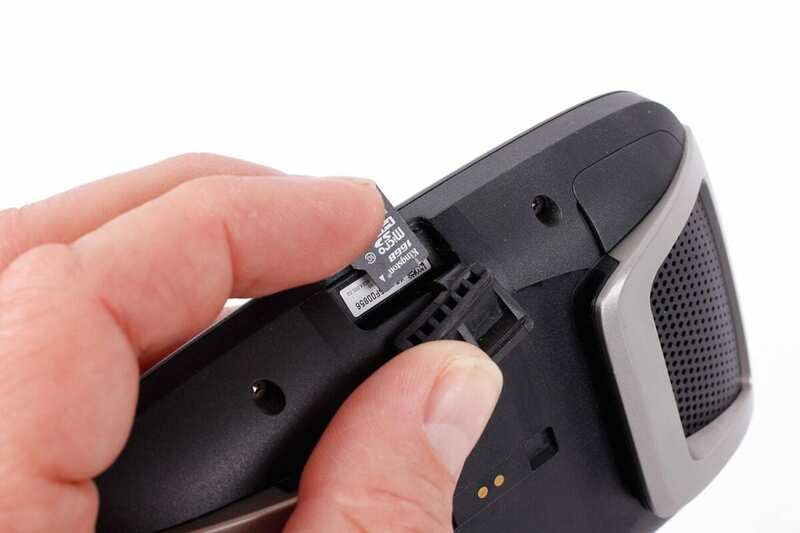 The built-in battery has an excellent capacity, offering enough power for rides of several hours without connecting it to your bike – for instance if you pop it in your rucksack and rely on the audio instructions. The Rider uses a capacitive screen (as on smartphones and tablets), which is brighter than the older touch screens and more responsive. Unlike your phone though, it works flawlessly with gloves on, and even in the rain. This is a genius piece of engineering, and since the recent update it’s been improved with slightly larger buttons on the main map page; I’ve used it in all weathers with no problems at all. Don’t underestimate the value of the live traffic data when you’re on the bike – yes, we can filter through, but if a motorway is closed due to an incident, we’re still stuck. The TomTom will also offer faster routes if it finds them, something very helpful on a recent trip through London. 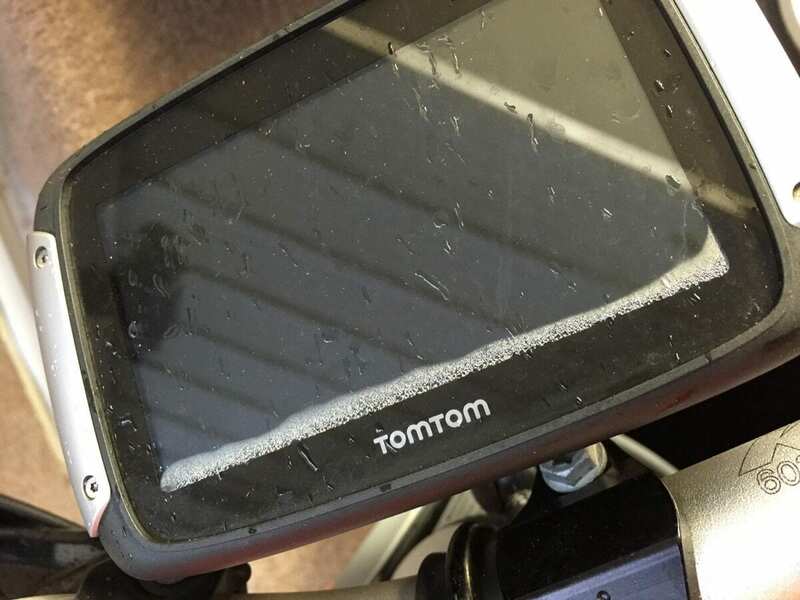 The new TomTom Rider is a stunning piece of kit – I use it on all but the most local trips now, have a second bike mount for popping it on road-test machines, and use it without fail in the car (where it’s saved me enough time to get out for a hack on the bike when I get home). Strongly recommended. To use the Rider’s live traffic and speed cameras, you do need a data-enabled smartphone. Connecting via an iPhone is very simple, with the Bluetooth network tethering automatically re-enabled when the two devices are within range. As is so often the case, the less structured Android platform isn’t quite as easy – my work phone (a Samsung Galaxy S4) switches off its tethered data connection, leaving me often realising I need to manually reconnect it once I’ve set off on my journey. It’s down to the way some Android devices are programmed, but you get used to it if you’re not constantly switching between different devices, and fans of Android will no doubt accept it as one of its many ‘features’. 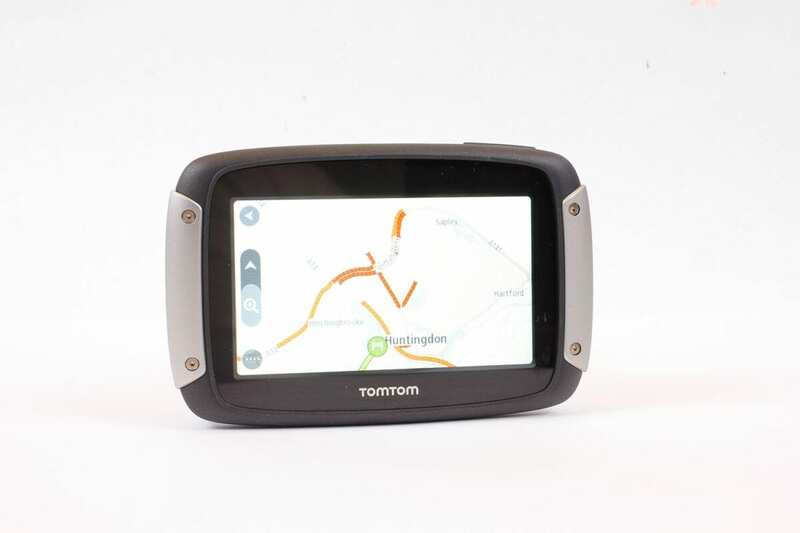 Whichever device you use the TomTom with, live traffic saves a lot of time trying to compare Google Maps routes with the sat-nav to decide on the least congested route as the Rider is constantly drawing on numerous sources for the latest data. It’s not infallible, but it’s generally very accurate. I’ve grown to trust the decisions it makes, and so far it’s not let me down. Riding for two hours in an absolutely terrible rainstorm, my Rider 400 took on water and failed. It still navigated me home, but the capacitive touch screen became unresponsive. Once home, I left it in the airing cupboard for several days, but it never dried. The Rider series is rated to IPX7, meaning it can withstand being immersed in one metre of water for 30 minutes. The fact that I couldn’t get the moisture out tells me the seals are pretty good, and after speaking to TomTom, I stripped this unit apart and discovered excellent seals on every possible point. The Rider would of course be covered by its warranty, and while I was undoubtedly unlucky, I did track down one other user who’d had his leak in more extreme conditions. His was just outside its warranty period, but was replaced by TomTom without hesitation. 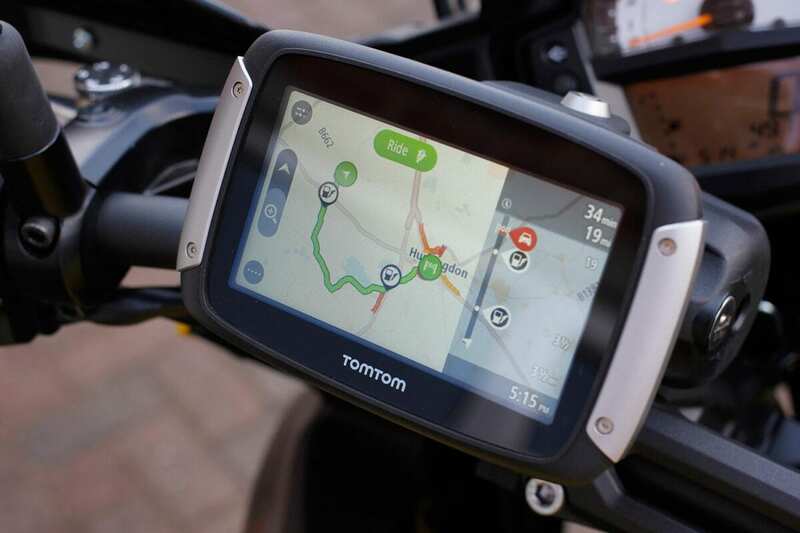 Willem Janssen, Senior Product Manager at TomTom told me that “The Rider 400 supplied to Motorcycle Sport & Leisure for review was from an early production batch. A very small number of units from this batch were not 100% watertight, an issue that has since been rectified. 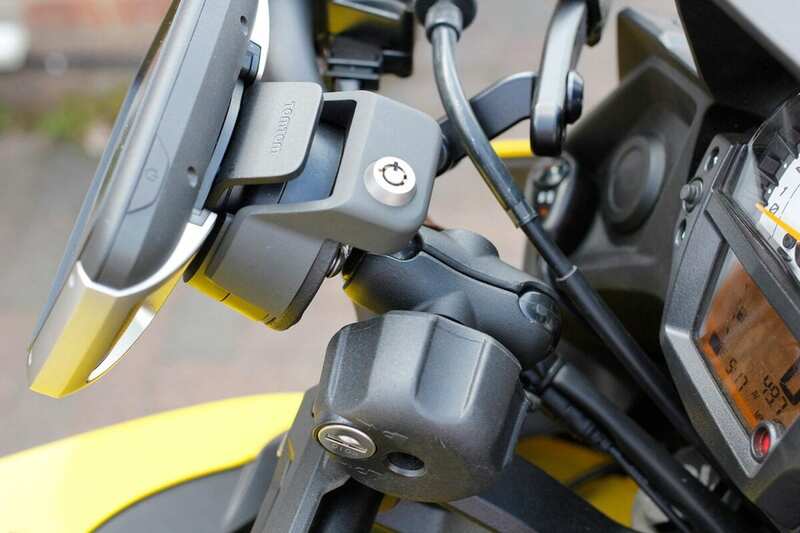 All TomTom Riders now in production are fully compliant with the requirements of IPX7”. I know the other user had been a very early adopter, and having seen inside, I’ve every confidence that the Rider will not let me down, and that the customer service will support me if I have any problems. I’m certainly not put off, and nor should you be.